Photo of Needles Overlook in Bears Ears National Monument by IDA Board President, Jim Dougherty. IDA is ending 2016 with the wonderful news of President Obama’s designation of two new national monuments – one in Utah and one in Nevada – setting aside an additional 1.65 million acres into the federal estate. For the past several months, IDA has been working with a number of communities in promoting the Bears Ears National Monument, so the President’s announcement is welcome news. 2016 was the 10th anniversary of the first IDSP (International Dark Sky Place) at Natural Bridges. In this intervening time, IDA and others have managed to bring the issue of the loss of night skies to the forefront of conservation. To have this language in the enabling legislation of a BLM national monument is a huge step, and shows just what can be accomplished in 10 years with firm, constant pressure. Congratulations to all those involved in this monumental achievement…and what a wonderful end-of-year gift to us all! 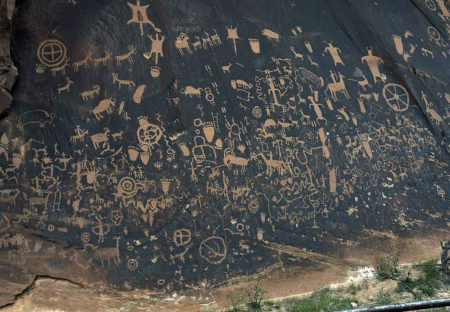 Photo of Newspaper Rock petroglyphs in Bears Ears National Monument by IDA Board President, Jim Dougherty.